Holiday cottages near Westward Ho! In North Devon. 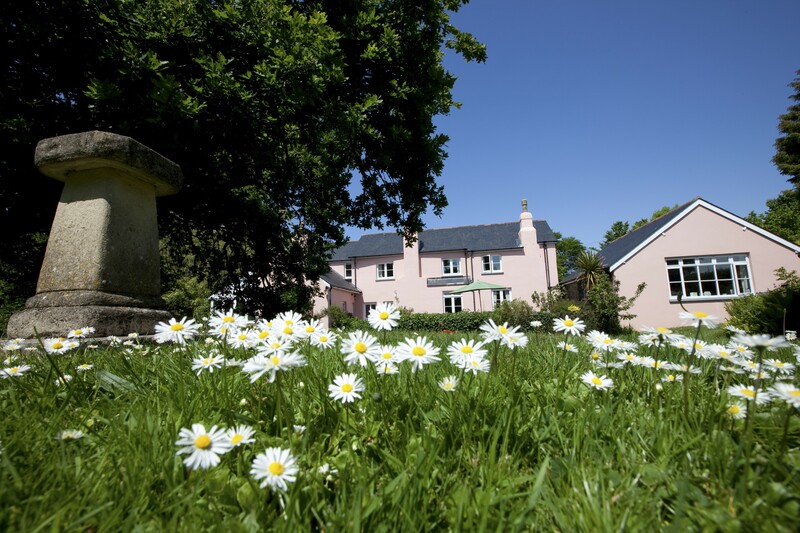 Cornborough Coombe, formally Orchard House, and Cornborough Cott, formally Little Orchard are two beautiful North Devon holiday cottages within easy reach of Westward Ho! Ideally located for exploring the North Devon area, and great as a base for golfing, surfing and fun packed holidays. And further beyond, Cornborough Coombe and Cornborough Cott are suited for families and couples respectively looking for a luxury holiday cottage base in Westward Ho! Cornborough Coombe, which when booked includes the Cott comfortably accommodates up to 10 in five bedrooms, and is suitable for less able-bodied guests. The Cott, which is available to book on its own outside of the school holidays sleeps up to two. Cornborough Coombe, described by guests as a fabulous Enid Blyton House is full of character, where relaxation and adventure go hand in hand. Its historic Devonshire pink facade makes a handsome statement about what you can expect inside – a luxurious and beautifully furnished property that will delight families and friends. 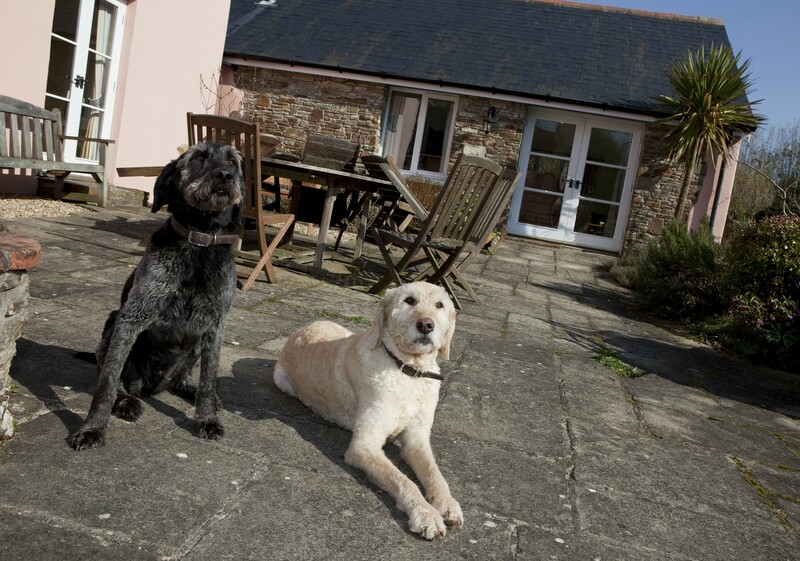 Cornborough Coombe sleeps 10 guests in 5 bedrooms with 4 bedrooms in the main house plus 1 in the adjoining self-contained studio annexe that we call Cornborough Cott. Book Cornborough Coombe and use of the Cott is included in the price – the whole place is yours at no additional cost. If you don’t need the Cott it won’t be let to anyone else during your stay. Cornborough Cott can be booked on its own outside school holidays. When this happens we will ensure the main house remains empty so Cott guests can enjoy having the gardens and grounds to themselves. 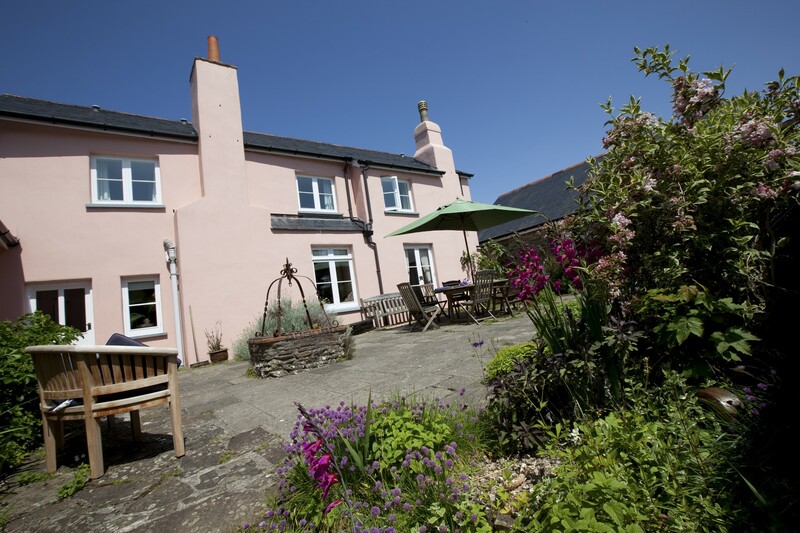 Cornborough lies at the end of a private lane in a wonderfully secluded spot within walking distance of a pub and just a mile from the sandy beaches at Westward Ho! and Northam in North Devon which have some of the best surfing in the South West. The interior is tastefully decorated and beautifully furnished, with style and class throughout. The whole house feels like it was made to be enjoyed with a massive kitchen/diner at the centre of the house. It’s where everyone meets, eats and has a good time, enjoying relaxed mornings, lazy lunches and fabulous family dinners. There is a large patio outside which is a real sun-trap and ideal for family barbecues after a fun day at the beach or walking along the many trails all around the area. The house is great for large parties with children of all ages; there is a games-room with table-football and a PlayStation and upstairs there is a box-room with a toy collection. Cornborough is set in almost an acre of private grounds with lawns, woods and gardens perfect for exploring, climbing and playing games all day long. The house has many original features with uneven floors and a twisting, narrow wooden second staircase, so be careful after dinner! 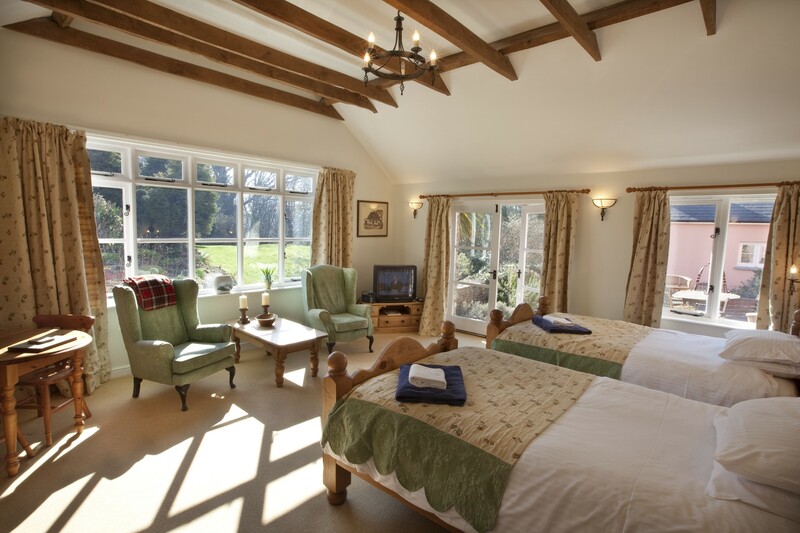 There are four large bedrooms that sleep 8 people, two en suite, looking over the gardens. This house is made for memorable holidays with family and friends. A Devonshire Cream Tea of delicious locally made scones, jam and clotted cream will await your arrival. We include gingerbread men for children (gingerbread Santas' at Christmas) while at Easter you'll find chocolate cream eggs in case you fancy an Easter Egg hunt in the house or garden. Cornborough Cott is a beautifully presented studio holiday cottage that sleeps 2 people, next door to the main house, all on one level and suitable for less mobile guests or simply any family members who want to escape the main house for a little peace and quiet. 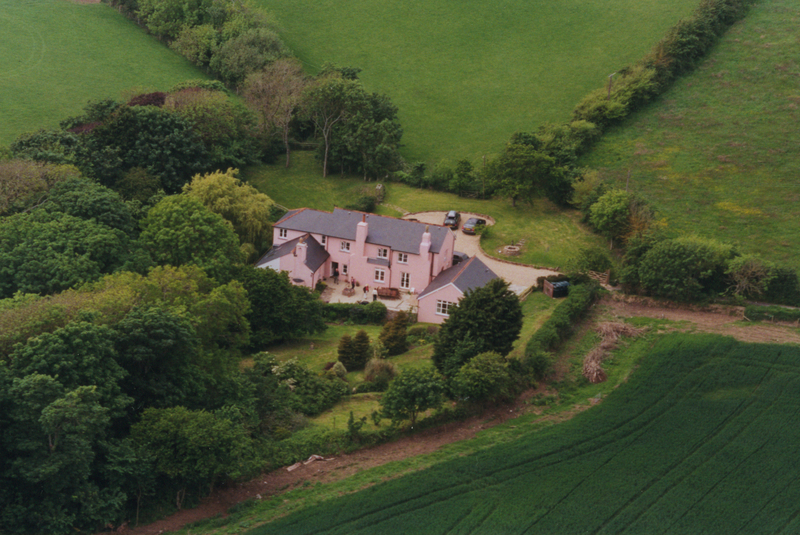 It is ideal for romantic weekend breaks out of season or for anyone looking to enjoy the lovely North Devon countryside. The cottage has under-floor heating, so perfect for relaxing after a long winter walk along the deserted beaches. The spacious living-room/bedroom with its high vaulted ceiling and remote control curtains means you can lounge in bed and look out onto the glorious gardens without ever getting out of bed. The kitchen-area and wet-room offer everything you need to enjoy your stay. Cornborough Cott’s garden and patio are full of country plants and perfect to sit out and relax. Peace and quiet is all around and with miles of coastal path, stretching along the spectacular North Devon coast and with the local pub within easy walking distance, you are sure to have a very relaxing holiday. One well behaved family pet is welcome, two small pets with prior agreement with owners. There is a small charge of £30 per animal per visit. Short breaks are available outside school holidays or within seven days of arrival if we have a vacancy. We keep our availability page up to date, so please check it for your preferred dates for Westward ho! holiday cottages availability. Shops: 2.5 miles. Pub: 0.5 mile. To see more details about the beautiful Cornborough Combe click here or for more information about Cornborough Cott click here.